Peripheral neuropathy often causes numbness and pain in your hands and feet. as traumatic injuries, infections, metabolic problems and exposure to toxins. One of the most common causes is diabetes. neuropathy, including the use of the ReBuilder. 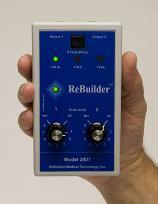 The ReBuilder is an electronic device that soothes irritated nerves and restores full function. The ReBuilder sends a confortable electronic impulse to your feet and legs that can stop your pain, tingling and numbness. Results are felt immediately, accumulate with time and can be permanent. The ReBuilder is effective for hands, knees, elbows, back, feet, and legs. It works for many types of pain: carpel tunnel syndrome, sciatica, low back pain, COPD, post polio syndrome, PAD, PVD, MS, MD, arthritis, etc. Increase the blood circulation to your feet-no more cold feet!